We recently took a trip to our local Scrap 4 Art location to donate some materials that we would have otherwise thrown away or recycled. While we were there, we had the opportunity to snap a few photos to share. This wallet was made from a recycled juice container. Kids love these! One of the many things we love about Scrap 4 Art is their community involvement. Their materials are reused by students and adults for arts and crafts projects. They educate the community about waste reduction and encourage new solutions for environmental problems. It is amazing what you can create with materials that you normally wouldn’t think twice about! 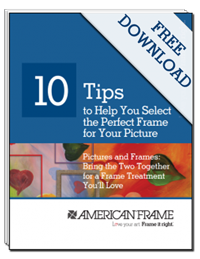 At American Frame, we create scrap on a daily basis, so for us it was a no brainer to decide what to do with it. These crayons were made from some of the cardboard tubing that we donated. This colorful window piece was made from our cardboard tape rolls. With all these materials think of the possibilities!